We all know about the birds and the bees, but what happens when you put them both together in close proximity? Will the bird swoop down to swallow up the bee, or will Mr. Bumble position his stinger in time to fight back? The blue bird has the speed advantage, but the bee has a more powerful arsenal and his tiny size can make it easy to hide. Who will win out with this classic rivalry of enemy animals? Only time will tell as right hand can't help but pick a fight with left hand when wearing these fun mittens. With the perfect pairing of natural foes, you guarantee endless conflict, fun, laughter and amusement. Your children will love them because of the great characters and endless possibilities of fun. You will think they are wonderful too thanks to high quality wool that makes them soft, stretchy, warm and durable. So bring some light to the dull gray of winter with these cheerful mitts. Incredibly fun, and totally functional, these mittens are sure to attract attention and spur conversation. Their friends will want to have a turn wearing them, and all of the other parents will be asking you where they can buy a set. Stop fighting your kids to bundle up for winter weather. Get them these, and they will be begging you to wear them every time they leave the house. 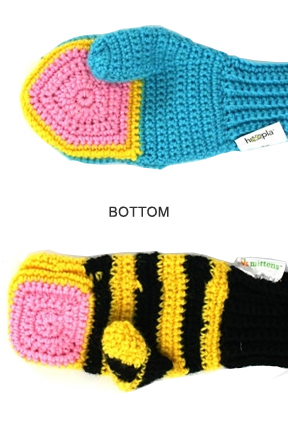 For children, these mittens are just as useful inside for play as they are outside for utility. Perfect as puppets or mittens, they will be able to act out their favorite National Geographic style scenes or put on a show of their own. You will find them engrossed in story telling as the bee buzzes from flower to flower, or the bird surveys the area to find the perfect place to nest. Friends and family members will be amused, and unsuspecting strangers will be surprised, and quite possibly annoyed, thanks to these animal mittens. They add excitement and playfulness to an otherwise dull piece of clothing, plus they are high quality and offer the perfect level of warmth. 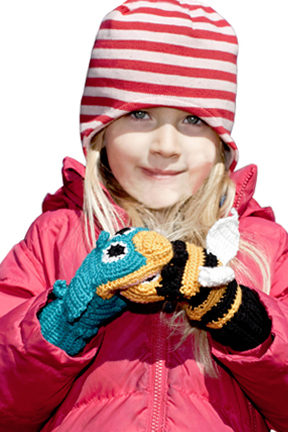 You’ll love these Predator vs. Prey Bird and Bee Mittens so much you will be preying for snow, and happy when the temperature starts to fall. 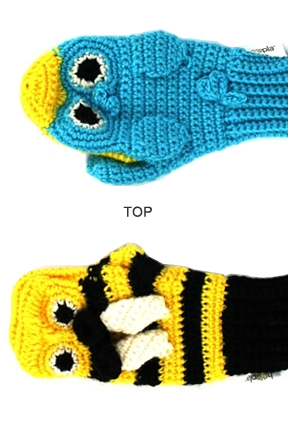 Predator Vs. Prey Mittens for kids: Bird Vs Bee - Introduce them to the birds and the bees early, but do it in a fun, non special talk sort of way. The swift bird can easily run down the bee, but will he be able to sting back to save his hide? You be the judge. This classic rivalry never gets old. Order Yours Today!